I’ve been asked time and time again what is my stance on protein treatments. Women want to know what are the benefits? Do I incorporate them in my hair regimen? Which products do I use? At what frequency should they be done? The easiest way for me to explain the benefit of protein treatments without scientific jargon is this: our hair is made up of over 90 percent of the protein best known as keratin. When our hair gets damaged by normal weathering, chemical treatments, sun exposure, pollution, washing, drying, combing, and styling heat use, it can be only temporarily mended by protein. A protein treatment works by filling in gaps present on your hair strand and forming a temporary bond. In order for a protein treatment to be effective it must contain hydrolyzed proteins, which just means the size of the protein must be small enough to attach to the hair shaft. Because the mending of your hair is only temporary, you can’t do just one protein treatment a year. Your hair will thrive if you regularly incorporate protein treatments in your hair regimen. I suggest anywhere from 1-6 weeks depending on your hair and the type of protein treatment you are using. I’ll delve further into this momentarily. Protein treatments are good for your hair, so there is no harm done is using them as a part of your hair regimen. In fact, I encourage everyone to give them a try, especially if you are a naturalista who frequently uses heat or is color treated. 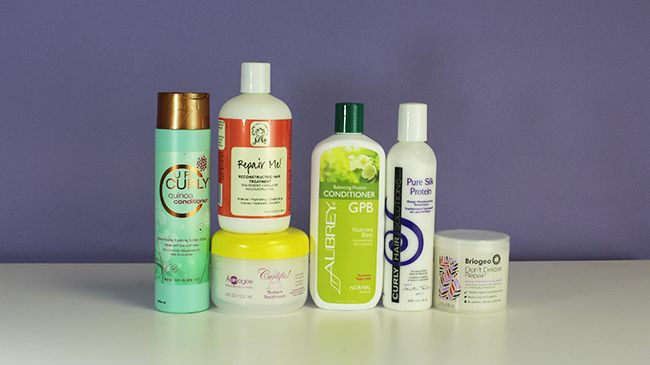 Protein enriched products help to strengthen the hair follicle. A protein treatment has different protein properties that attach directly to the hair follicle and harden the cuticle layer. This places a barrier around the follicle, which protects it from further damage. I’ve noticed four main types of protein conditioner treatments: protein packs, reconstructors, deep penetrating treatments, and light protein treatments. The hair's current condition will decide the type of protein conditioner needed for treatment. Use a reconstructor for severely damaged hair. For moderately damaged hair, use a deep penetrating treatment. For slight damage and routine treatments, use protein packs or light treatments. Protein is very much a part of my regimen. I primarily use it during my washday. On a biweekly basis I use the Organic Root Stimulator (ORS) Hair Mayonnaise after shampooing with the SheaMoisture Yucca and Baobab Thickening Shampoo. The ORS Hair Mayonnaise gives my hair a protein boost, leaving it soft and supple until the next treatment. It’s easy to use and the product is very affordable. On a monthly or bimonthly basis, I will use the ApHogee Keratin 2 Minute Reconstructor. This product is a bit more intensive, thus I don’t need to use it often, but when I use it my hair is so happy. During your next wash session I want you to give a protein treatment a try. Evaluate the type of damage you have and select the appropriate protein treatment that is suitable for your hair and then come back and share your results with me! Do you incorporate protein treatments in your regimen? Which are your favorites?